What was really odd is if I went into the preferences and right clicked the disk, the backup would work and I could open all my old stuff, just the hourly would not work. 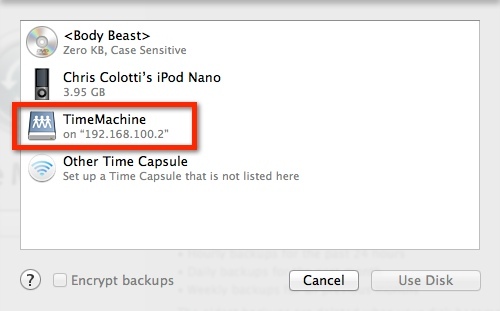 I also noticed there was no information on the latest or oldest backup so clearly something was messup here with Mountain Lion Time Machine and my PX4. It seemed after a little time googling there was some options, but as I was reading I decided to try to put some pieces together, so the first thing I did was DISABLED time machine on the PX4. Then I tried to just mount the TimeMachine Folder to see if that would work and it would not show up in the list of available disks. What I did ultimately discover for the work around was to mount the PX4 TimeMachine folder using Finder “Connect to Server” as the IP Address. Once this was done I could click the Mountain Lion Time Machine icon in the dock, select “Backup Now” and it worked just fine as you can see below. Lastly just for kicks I decided to Un-Mount the share so see if Mountain Lion Time Machine was smart enough to re-mount the share, find the sparsebundle and keeping working, and in fact it does. 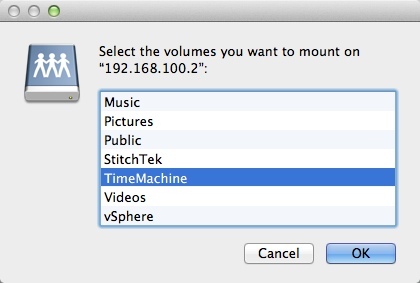 The only hitch to get this to work seems to be mounting your PX4 by IP Address, picking the TimeMachine Share, and selecting that as the disk in the Mountain Lion Time Machine preferences. From there it works just fine and all this is still WITHOUT the Time Machine option in the PX4 actually enabled. I suspect that a firmware update is needed from Iomega to get the native function to work again. Lastly in all my efforts I did try deleting everything so I did lose all my old backups in the process while I thought it was a sparsebundle issue between Lion and Mountain Lion. 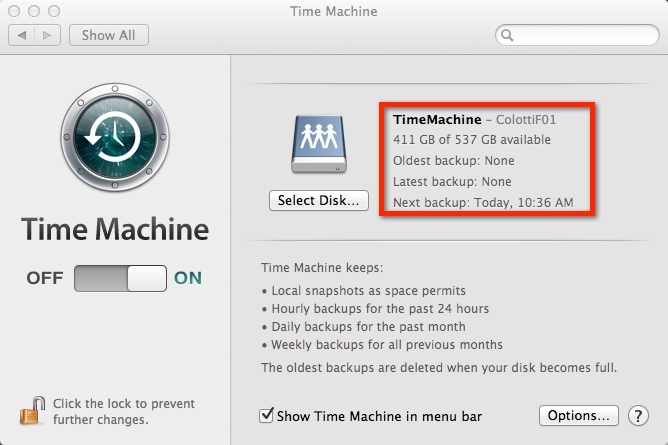 Hopefully this helps you avoid that and you should still see all your old backups in Mountain Lion Time Machine when you get it working. I hope this helps! I have exactly the same issue on my 2010 Mac Book Pro with Mountain Lion, however what is interesting is TimeMachine on the Iomega PX4 works perfectly with my 2011 Mac Book Air and Mountain Lion. This issue seems directly related to the MBP…. I for the life of me don’t understand what you mean by this unclear sentence. If you mean you went into the menu for Time Machine and chose Open Time Machine Preferences, then what do you mean by “right clicked the disk”? I tried right-clicking everything on the drop-down menu and nothing offered me an option. If you meant something else you are not writing clearly. I wonder if he misspoke. 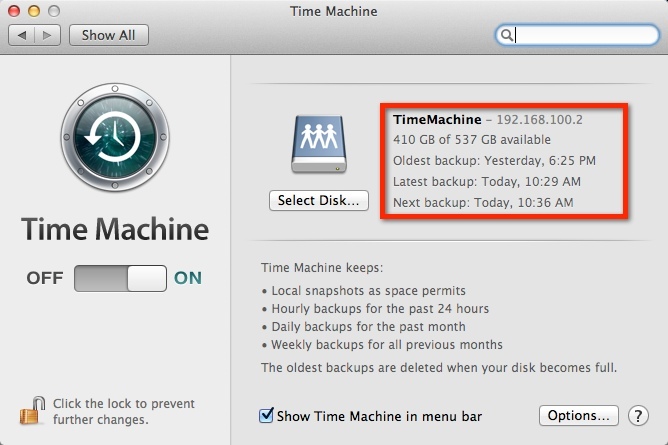 If his situation was like mine, he may have meant to say that he went into Time machine and could see some backups that were there. This solution worked for me to connect to my Iomega personal cloud edition. Kudos Chris.